A key bipartisan pair of lawmakers warned Sunday that the United States and its allies must closely examine the details of any potential deal to curb Iran's nuclear program, stressing the importance of ensuring the Iranians are only developing nuclear technology for peaceful purposes and signaling the likelihood of a fresh round of sanctions to keep pushing Iran to deal squarely in negotiations. Their comments came only hours after international talks to curb Iran's nuclear program fell apart in Geneva, Switzerland, with negotiators still at odds about Iran's uranium enrichment program and a plutonium reactor in that country that some worry will be used to weaponize its nuclear technology. International negotiators will reconvene on November 20 for another round of deliberations, but in the meantime, lawmakers in the U.S. are sounding off about their demands. 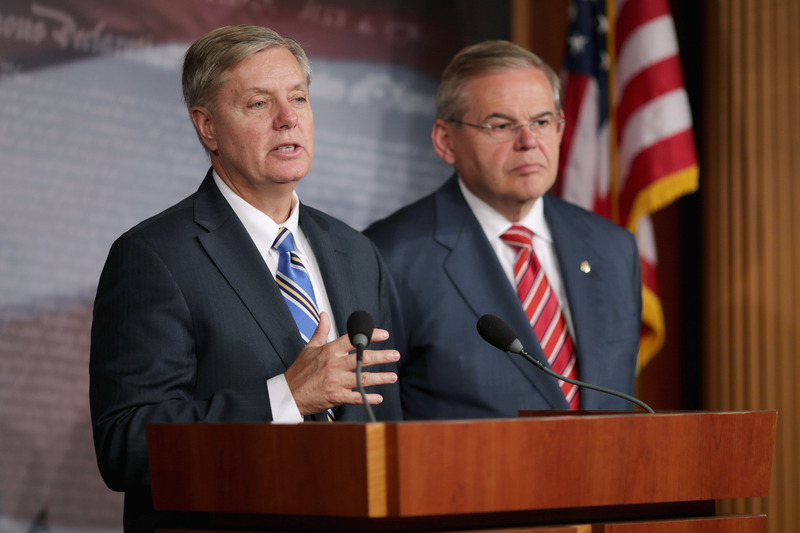 Sen. Bob Menendez, D-N.J., who chairs the Senate Foreign Relations Committee, echoed Graham's concerns about the Arak facility and Iran's uranium enrichment, telling ABC News: "It seems to me we're moving more and more away from the global position, the position adopted by the U.N. Security Council, that basically says two things -- cease all enrichment and accept more protocols, which means more invasive inspections." "There is no right under international law for domestic enrichment," Menendez explained. "There is a right to a peaceful, civilian nuclear program, undoubtedly. But our neighbors here in the United States, Canada and Mexico, they have nuclear programs, but they don't enrich domestically. So this suggestion that there is this right to enrichment domestically is problematic." He also commended negotiators for taking a hard line against the Arak facility, which he described as a "heavy water nuclear reactor whose only purpose, from my perspective, in a country that has already huge oil reserves, is ultimately to create the type of nuclear fuel for nuclear weapons." Both Menendez and Graham signaled the likelihood of a new round of sanctions moving through Congress, arguing that the U.S. and its allies must keep the pressure on Iran if they hope to secure a deal. "I think the only thing that's got them to the table - and I will give the Obama administration credit for this - they've created really good international sanctions. If we back off now, I think that's exactly the wrong signal," Graham said. "So a new round of sanctions will be coming from the Congress. The Congress will define the end game, because we're worried about the end game, not some interim deal. You can't trust the Iranians." Menendez said he expects the Senate to "move forward on a package that ultimately would send a very clear message where we intend to be if the Iranians don't strike a deal and stop their nuclear weapons program." Both lawmakers clarified that the new round of sanctions could be rolled back if Iran complies fully with any eventual agreement. As the latest round of talks took flight in mid-October, President Obama's administration asked lawmakers who were pushing for additional sanctions to hold off on any move that could disrupt the high-stakes diplomatic push. The administration has not yet responded to renewed calls for sanctions in the wake of the negotiations' collapse. Despite some of the dour analyses that accompanied the breakdown of the talks in Geneva, others argued that the overall picture was more encouraging than headlines might suggest. "I think any time that you are actually at the diplomatic table negotiating on a question that, just a year or so ago, would have been unfathomable - the idea that we could actually get Iran to back off its pursuit of nuclear weapons," said Rep. Debbie Wasserman-Schultz, D-Fla., also the chair of the Democratic National Committee, on CNN. "It demonstrates that the sanctions that we've imposed thus far have been extremely painful and effective and that President Obama's emphasis on trying to do all that we can to make sure that Iran cannot attain those nuclear weapons is working and we're going in the right direction." "Of course," she added, any deal "has to be one that makes sense for the United States' security interests and also the interests of our allies in the region." At least one U.S. ally in the region, Israel, greeted the collapse of the latest round of talks with open arms, with Israeli Prime Minister Benjamin Netanyahu warning that the U.S. and its allies were conceding too much to Iran in exchange for too little. "I'm expressing, as I said, not only the concerns of Israel but the concerns of many in the region. Some of them say it aloud, some say it behind closed doors, but I'll tell you this is the broad feeling...that Iran might hit the jackpot here. And it's not good. It's not good for us, it's not good for America, it's not good for the Middle East, it's not good for Europe either," Netanyahu said Sunday on CBS News' "Face the Nation."